As with many of today’s network-centric systems, the SDR uses the very latest technology. For example, the baseband boards in the MSN 8100-H are densely populated and use fine pitch high density connectors, as well as large and expensive BGA/FPGA devices, all of which make the boards difficult to test by traditional methods. To overcome these debug and testing challenges, Thales has adopted the XJTAG system for use by development and production engineers at its Crawley, West Sussex (England) facility. 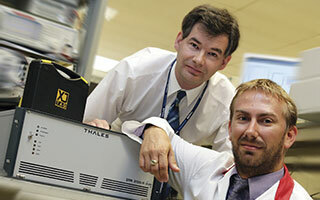 The XJTAG system is also being used by Thales’ contract manufacturing partner. Initially, the XJTAG system will be used to debug and test the baseband PCBs that form part of the MSN 8100-H SDR. The XJTAG system is designed to cut the cost and shorten the development cycle of electronic products and provides a unique solution that can test JTAG as well as non-JTAG devices. XJTAG can test a high proportion of a circuit including BGA and chip scale devices, SDRAMs, Ethernet controllers, video interfaces, flash memories, FPGAs, microprocessors and many other devices. XJTAG can be used to debug and test any circuit provided it has at least one JTAG-compliant device present. Thales UK’s defence activities encompass optronics, air defence, sensors, communications and naval systems. The company is the UK’s second largest defence contractor and has been a supplier to the MoD since the First World War. Thales employs 10,000 staff in the UK and 60,000 people in 50 countries. XJTAG is a fast, extremely versatile and cost-effective tool for generating high test coverage on PCBs containing both JTAG and non-JTAG devices. The XJTAG system has enabled us to cut the development time for debugging and testing boards by around 20 percent and it has provided the basis for a common design for test strategy, spanning development, first article build, production and field service. We looked at other boundary scan solutions but we opted for XJTAG due to its price and ease of use, and the fact that test scripts are device rather than board-centric, which makes them reusable on different projects. Thales UK’s MSN 8100-H software-defined radio (SDR) platform, the first European operational software radio, has been designed as the primary component of a comprehensive high frequency communication network benefiting from the attributes of a versatile, programmable and configurable multi-channel receiver/exciter. This radio is designed for naval and ground based applications and will be used on the Royal Navy’s next class of Destroyers, the Type 45, scheduled to enter service in 2009.